Please join us for national educator Diane Henry's class. 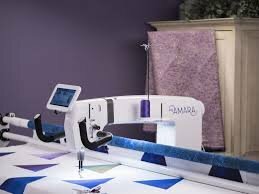 Whether you've just purchased or are just about to purchase a new longarm, or your planning of borrowing one, this is the class for you! We will be covering all the basics: loading the quilt in the frame, threading and tensioning the machine, choosing stitch regulation or not, and basic maintenance. But the fun doesn't stop with the mechanics! There will still be plenty of time for learning some basic free-motion quilting techniques and ways to manage the less than perfect quilt tops that make quilting in real life what it's all about. Date: May 3, 2019, 9:00am to 12:00pm. Cost: $49. Please call the shop to register: 540-786-2289.